HCM CITY — Renovating its growth model and improving productivity are among the key requirements to improve Việt Nam’s economic competitiveness, a seminar heard in HCM City on Friday. Dr Phạm Thị Thu Hằng, former general secretary of the Việt Nam Chamber of Commerce and Industry (VCCI), said the country’s economic competitiveness remained low. According to the World Economic Forum’s Global Competitiveness Index, Việt Nam dropped three places in the ranking this year to 77th out of 140 economies. Hằng said an analysis of the factors that measure the economy’s competitiveness showed infrastructure to be one of the weakest points in Việt Nam’s competitiveness index, especially the quality of roads, seaports, airports and power supply. Labour productivity remains low, she said. Việt Nam was considered to have abundant human resources but there was a supply-demand mismatch in many industries, she said. Vocational standards had been promulgated but were not comprehensive, lacking consistency and incompatible with international professional standards. Besides, Việt Nam lacked a reliable and consistent labour market forecast model and statistical and analytical experts, she said. 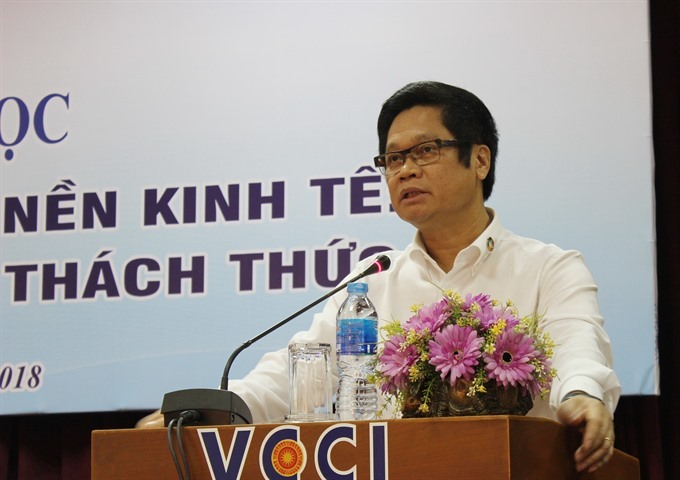 VCCI Chairman Vũ Tiến Lộc said the issue of competitiveness is increasingly receiving attention from governments in many nations, and raising Việt Nam’s competitiveness is also a major goal of the Party and Government. The Government had issued a resolution on improving the business environment and enhancing national competitiveness to make Việt Nam one of the four most competitive countries in the ASEAN bloc by 2020, he said. The country’s economic competitiveness was mainly based on existing and non-renewable factors and not innovation, he said. Productivity was among the core factors determining the competitiveness of enterprises and the economy, he said. Lưu Đình Vĩnh of the College of Economics of HCM City said improving labour productivity required a change in thinking: Instead of working overtime, businesses should invest in the training human resources to instil working skills. Experts also said businesses should have a mechanism to promote talent and usher in a creative culture to encourage employees to maximise their potential. Besides knowledge, technology is also a factor affecting labour productivity, production and the efficiency of enterprises, they said. Therefore, it is necessary to strengthen the link between domestic and FDI enterprises to learn and adopt advanced global models and technologies, they said. To enhance the competitiveness of small and medium-sized enterprises, Vũ Kim Hạnh, director of the Business Study and Assistance Centre, said enterprises must attach importance to quality and value addition, embrace technology and regularly update themselves on the market. But they usually lack market information, and so one of the important things the State management agencies have to do to support enterprises is to provide them with market information, she said. Besides World Bank and World Economic Forum criteria, the country should also consider the 17 UN sustainable development goals to improve its competitiveness, he suggested.